I have been a very busy painter this weekend. As you can see I have been painting on canvas, probably one of my favourite surfaces, not really any prepping involved and they are so portable and you can move them around easily in your home or put away for the holiday season. 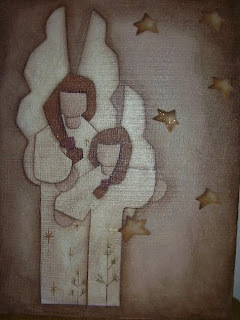 This angel pattern is again a Monika Brint design. This is supposed to be a wood cut out piece but I place it on canvas. The stars are wood and painted then glued on. JB helped me with the stars, I was going to put Peace on Earth down the side but we went with the stars instead. It is a rather simplistic design but everyone loves angels and this is particularly a very peaceful looking painting. I also have a collection of snowmen I am dying to show you but me the idiot when it comes to cameras I had the flash on and the glare from the sealer I put on the canvas did not give you a good result. Tomorrow camera in hand I will take another pic to show you along with my new own design snowman on a smaller canvas. Monika inspired me to do my own design. And here is a little family I decided to group together instead of selling them separately. They are just too cute to sell individually. I think the little fella would be lonely without MoM or DaD to care for him. And a little grubbied tea lite to keep them warm and cozy, but don't get too close you might all melt. Well best get moving on. Lots more to do. 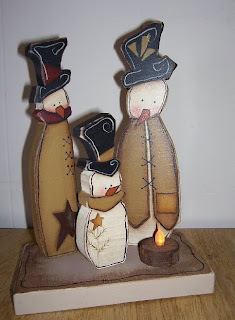 I have two Kim Klassen deSigns to do as well, the wood is cut, pattern read to transfer. I am trying to stay calm and focused as time ticks toward deadline. I sure hope all hell doesn't break loose before the end of the week. I love those...the tea light idea is cute! And you know I love Monika Brint ! I was thinking about you this weekend..!!! My final push is on too...my show is this Friday thru Sunday.....I finished up a fireplace screen today like the one in my header...that was a real GOAL of mine for show....then trying to do all the odds & ends..one piece needs something glued, tagged, wired etc! The week after the show is the Christmas Preview at the shop I paint for.....so the brushes continue to fly and the paint spatter!!!!! These are wonderful pieces. You paint so neatly and they look beautiful. Rock on! Love the angels on canvas, Les. Great job on both projects. Fabulous job on both Les!!! You've been really busy :) Keep up the good work!!! OMG Les, your Angels are stunning!...and your snowmen are so cute!! Awesome work! !